As you read this, Bryan Hollon (aka Boom Bip), has just finished his fifth full-length album, has plans to remix a track for Electric Light Orchestra, and is probably working on inventing an instrument which records the music he pictures in his head. In a nutshell: genius. His various collaborations range from cLOUDDEAD's Doseone, to most recently, Gruff Rhys of the Super Furry Animals, and he's remixed and been remixed countless times. He's also virtually a one man band. Not like he's got cymbals strapped to his knees and a harmonica hanging from his mouth, but he played every instrument on the album himself. His recording process hasn't changed much since his previous album Seed to Sun, but his surroundings definitely have and that's made a huge difference. "I think because this is the first record I've recorded since I've been out in L.A., that definitely had an effect on me having a new perspective, a new place, and a new studio." 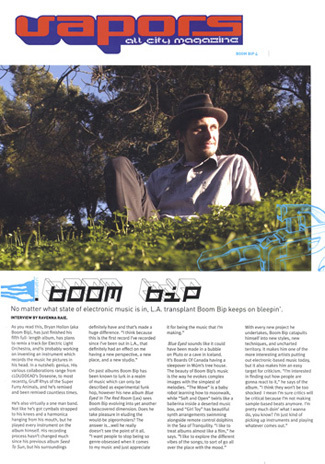 On past albums, Boom Bip has been known to lurk in a realm of music which can only be described as experimental funk hop, however his new album Blue Eyed in The Red Room (Lex) sees Boom Bip evolving into yet another undiscovered dimension. Does he take pleasure in eluding the would-be pigeonholers? The answer is…well he really doesn't see the point of it all. "I want people to stop being so genre-obsessed when it comes to my music and just appreciate it for being the music that I'm making." Blue Eyed sounds like it could have been made in a bubble on Pluto or a cave in Iceland. It's Boards of Canada having a sleepover in Mum's tree house. The beauty of Boom Bip's music is the way he evokes complex images with the simplest of melodies. "The Move" is a baby robot learning how to moonwalk, while "Soft and Open" twirls like a ballerina inside a deserted music box, and "Girl Toy" has beautiful synth arrangements swimming alongside remote control dolphins in the Sea of Tranquility. "I like to treat albums almost like a film," he says. "I like to explore the difference vibes of the songs; to sort of go all over the place with the mood." With every new project he undertakes, Boom Bip catapults himself into new styles, new techniques, and unchartered territory. It makes him one of the more interesting artists putting out electronic-based music today, but it also makes him an easy target for criticism. "I'm interested in finding out how people are gonna react to it," he says of the album. "I think they won't be too shocked. I mean, I'm sure critics will be critical because I'm not making sample-based beats anymore. I'm pretty much doin' what I wanna do, you know? I'm just kind of picking up instruments and playing whatever comes out."